From Simpsons Style Cartoon to customized dolls - Priyanka Chopra and Nick Jonas are definitely the couple of the moment! She was the first ever bride to have worn a wedding gown designed by Ralph Lauren himself! Prior to her's, the ace designer had only designed three wedding gowns in his life, and that too for daughter, daughter-in-law, and niece! P.S., it had the longest veil I've heard of or seen. How cute is PeeCee’s doll wearing a red saree, while Nick is looking dapper in a blue tux? Making Priyanka first ever Indian bride to have her own Simpson Cartoon. 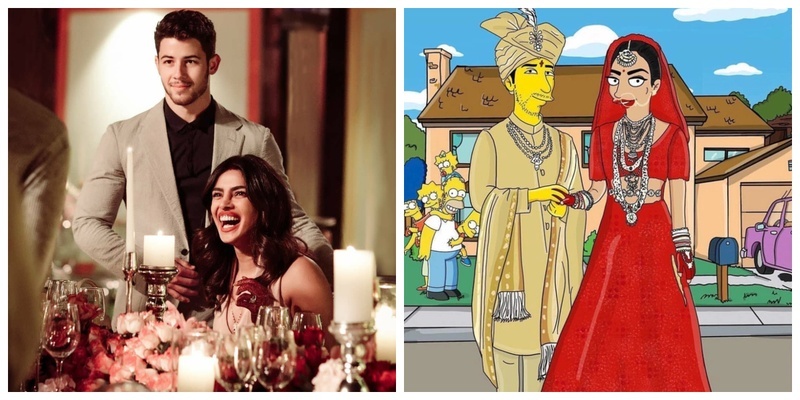 We are in love with the both of #Nickyanka’s Simpson cartoons - one from their Christian wedding and the other from their Hindu traditional wedding. P.S., Don't miss Homer, the priest, officiating their ceremony. Their wedding photos recreated into the cult cartoon is pretty damn cool.